Added on October 19, 2018 by Aliza Cohen. Solo Show at Domain Oakland! 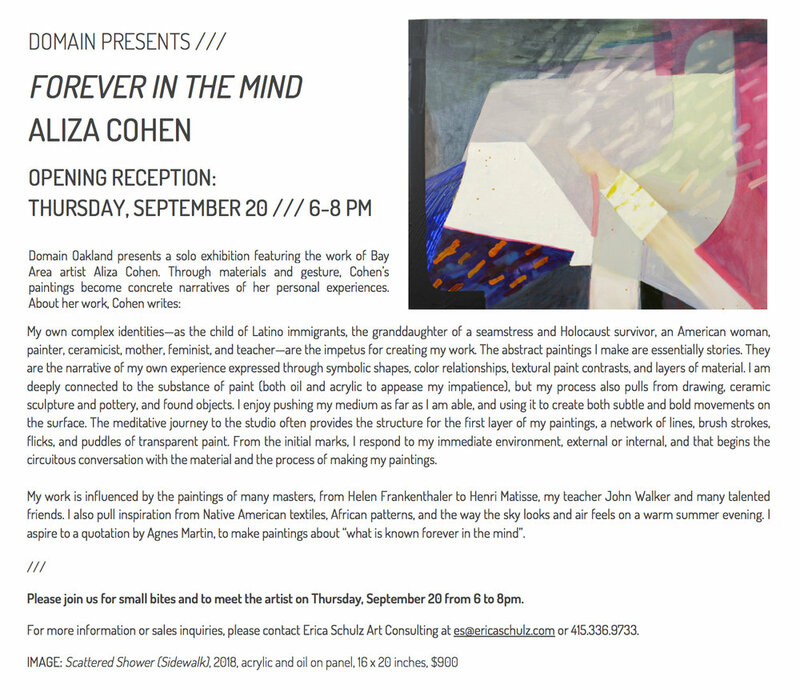 Added on September 20, 2018 by Aliza Cohen. Added on September 10, 2016 by Aliza Cohen. Check out my newer large paintings on the walls at Ritual on Valencia between 21st and 22nd. Show looks sharp and the coffee is better than good! Added on August 16, 2016 by Aliza Cohen. Added on June 21, 2016 by Aliza Cohen. Thank you to Jack Fischer for a Jurors Award for "Our Town" at the Richmond Art Center. Honored and excited. Added on June 10, 2016 by Aliza Cohen. My painting, You're In My Line" is in a great show at the Richmond Art Center. Opening this Saturday from 5-7. If you can't make it to the opening check it out before the end of August! The Richmond Art Center is a local gem with amazing classes and gallery space. Added on October 25, 2015 by Aliza Cohen. Several of my paintings from my residency at Jentel are now available for sale at Uprise Art in New York. Uprise is a curated collection of contemporary artwork and I am pleased to be included with such an interesting group of work. Added on August 21, 2015 by Aliza Cohen. My painting, "You're in my Line" was featured on SFMOMA's tumbler last week August 14! Check out the post here. Added on July 27, 2015 by Aliza Cohen. Wyoming! and a residency at the Jentel Foundation. Stay tuned for new work when I return to CA in a few weeks! Come and see my new work at Norton Factory Studios! Added on May 23, 2015 by Aliza Cohen. I will have many new paintings and prints on view at East Bay Open Studios the weekends of June 6-7 and June 12-13. Preview party on June 5 from 7-10, wine and beer and food trucks! Check out my new work plus the work of many other talented artists in a great building. Look forward to seeing you there! Jentel Foundation Artists Residency and East Bay Open Studios! Added on March 17, 2015 by Aliza Cohen. Awarded a residency at Kala Art Institute! Added on November 21, 2014 by Aliza Cohen. I am looking forward to being a part-time artist in residence at Kala Art Institute beginning in December. Artists in Residence have access to the Kala printmaking studios, and I will be working mostly on monotypes and perhaps some intaglio. I am hoping for a productive and learning-filled month! Check out the Kala website. Added on August 21, 2014 by Aliza Cohen. I am participating in several group shows this Fall, beginning with the Marin Society of Artists "Fresh Art" show juried by the director of the Mills College Art Museum, and the 13th annual auction show at Root Division. Looking forward to a busy second half of the year! Added on August 13, 2014 by Aliza Cohen. I'm super excited about the new paintings I have been making. Most of them are 6 x 6" for the upcoming show at the Sanchez Art Center. For a preview of some of the new little paintings, click here. This is a large benefit show and there will be many other artists showing as well. Come and see! For more info on the Sanchez Art Center, click here. Added on June 14, 2014 by Aliza Cohen. Currently in the beginning stages of painting 50 6 x 6" paintings for a group show at the Sanchez Art Center in Pacifica. All panels are primed and ready to go, its time to start painting. Opening for this benefit show is August 22! Would love to see you there.